The Garden Island Arts Council presents ten weeks of E Kanikapila Kakou.The theme is centered around the story of music and will feature the best of Hawaiian music, artists, composers and storytellers. Guests will also be invited to learn from kumu hula who will share their songs, stories and dance. The weekly events will be held at the Aqua Kauai Beach Resort Jasmine Ballroom from 6 – 9 p.m. every Monday beginning on Monday, January 21. The series of events will conclude on Monday, March 25. For more information, email Carol Yotsuda at giac05@icloud.com or call (808) 245-2733. The Number Film Festival is your opportunity to go back in time to watch 21 classic films on the big screen! Visit Kukui Grove Cinema from Friday, February 1 through Thursday, February 7 to catch a showing. Tickets to all 21 films cost $20 and can be purchased at the box office. Share the fun with family and friends and pass along your ticket. For more information, call Kukui Grove Cinema at (808) 245-3552 or visit kukuigrovecinema.com. Commemorating Waimea town’s proud history and tight-knit community, the Waimea Town Celebration annually features cultural and recreational events the whole family can enjoy. The nine-day festival includes hula performances, live entertainment, the Waimea Roundup Rodeo (one of the state’s largest Hawaiian rodeos), a long-distance canoe race, a celebration of last independent Kauai and Niihau king Kaumualii, the Waimea Film Festival, keiki (kids) games and rides, sports events and competitions, educational and cultural exhibits, craft vendors, food booths and more. The festival concludes with a two-day finale highlighted by the Heritage of Aloha Hoolaulea at the town’s historic former sugar mill. For more information, visitwww.waimeatowncelebration.com. Preserving Hawaii Workshop will take place on Thursday, February 21 from 5 to 7 p.m. at Monkeypod Jam in Lawai. Learn how to make adobo, a popular Filipino dish from Chef Clinton Nuyda, executive chef of Eating House 1849 by Roy Yamaguchi. Chef Nuyda will be sharing his favorite recipe for chicken adobo, which can be enjoyed following the workshop. For more information, or to purchase tickets visit https://monkeypodjam.com. The 9th annual Anahola Prince Kuhio Day Celebration will take place on Saturday, March 16 from 11 a.m. to 4 p.m. at Anahola Beach Park. The event reaffirms the leadership, stewardship, and vision of Prince Jonah Kuhio Kalanianaole and his legacy in perpetuating the growth of a healthy Hawaiian community on aina hoopulapula (homesteads land). The free celebration will feature live music, entertainment, and hula performances honoring the past and embracing the future of Prince Kuhio’s legacy. For more information, email La Contrades at khpono@gmail.com or Lady Ipo Kahaunaele-Ferreira at kahaunael002@hawaii.rr.com. 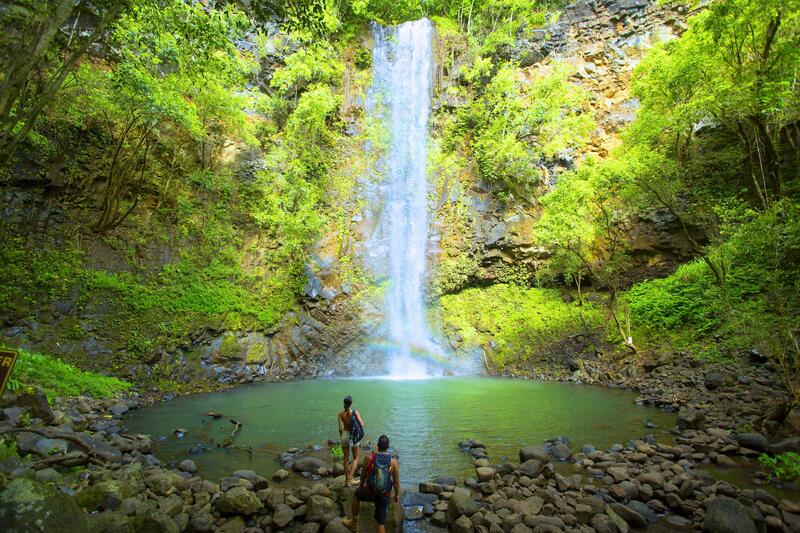 Also known as the Garden Island, Kauai is green and lush with flora from mountain to ocean. The island offers more than 50 miles of white sand beach – adding up to more beach-per-mile than any island in Hawaii. Other Kauai natural wonders include 3,567-foot-deep Waimea Canyon (often called The Grand Canyon of the Pacific) and the towering 3,000-foot sea cliffs of the Napali Coast. Kauai’s abundance of outdoor activities – which includes kayaking, snorkeling, hiking, mountain tubing, horseback riding, ATV adventures, zip-line tours, and helicopter and boat tours – offers memorable vacation experiences for the entire family. For information about Kauai – Hawaii’s Island of Discovery – visitwww.kauaidiscovery.com, or call the Kauai Visitors Bureau at (800) 262-1400. You can also follow updates about Kauai on Twitter (@kauaidiscovery), Instagram (@kauaidiscovery) or by liking the Facebook page of the Kauai Visitors Bureau. The Kauai Visitors Bureau is a division of Hawaii Tourism United States (HTUSA), which is contracted for marketing management services in North America by the Hawaii Tourism Authority (HTA), the state of Hawaii’s tourism agency. The HTA was established in 1998 to ensure a successful visitor industry well into the future. Its mission is to strategically manage Hawaii tourism in a sustainable manner consistent with the state of Hawaii’s economic goals, cultural values, preservation of natural resources, community desires, and visitor industry needs.